The Federal Reserve left interest rates unchanged at their policy meeting this week as was expected. The post-meeting statement noted that the Committee expects to begin reducing the size of its balance sheet “relatively soon” as opposed to “this year” as had been in the June statement. This implies that there will be some sort of an announcement regarding letting maturing bonds run-off the balance sheet at the Fed’s September meeting. The market is currently pricing in a 40% chance there is another rate hike before the end of the year. Markets were mixed this week. The S&P 500 was flat and closed at 2,472. The Dow Jones rose 1.17% for the week and closed at a new All-Time High of 21,830. Year to date, the S&P is up 11.67% and the Dow is up 11.88%. Interest rates ended the week a bit higher. The 5 year and 10 year U.S. Treasury Notes are now yielding 1.83% and 2.29%, respectively. The spot price of WTI Crude Oil increased by 8.63% this week, closing at $49.72 per barrel. Year to date, Oil prices have fallen 7.45%. The spot price of Gold ended the week higher by 1.14%, closing at $1,269.34 per ounce. Year to date, Gold prices are up 10.62%. Initial jobless claims rose by 10,000 from last week, coming in at 244,000. The Labor Department noted no factors affecting the data this week. The four week moving average for claims held steady at 244,000. The Case-Shiller home price index rose by 0.1% in May, lower than expectations of a 0.3% increase. Prices rose in 14 of the 20 cities surveyed with Seattle (+0.9%), Las Vegas (+0.6%) and Portland (+0.5%) showing the largest monthly increases and New York City (-0.6%), Chicago (-0.4%) and Boston (-0.4%) seeing the largest decreases. Over the last 12 months, home prices as measured by the index have risen 5.7%. The first estimate of 2nd quarter Real GDP showed 2.6% quarter over quarter growth, slightly below expectations of 2.7%. This first print represents an acceleration of growth over the 1st quarter’s figure of 1.4%. The U.S. Senate has further delayed a vote regarding repealing and replacing Obamacare and may scrap the plan altogether. This was the result of two more GOP senators stating they would not vote for the proposal, leaving Republicans short of the votes they would need to pass the American Health Care Act. Adding to the uncertainty, Senator John McCain has been diagnosed with a brain tumor and the timing of his return is very much unknown. Markets were mixed this week. The S&P 500 rose 0.55% and closed at 2,472. The Dow Jones dipped 0.23% for the week and closed at 21,579. Year to date, the S&P is up 11.61% and the Dow is up 10.59%. Interest rates ended the week lower. The 5 year and 10 year U.S. Treasury Notes are now yielding 1.80% and 2.23%, respectively. The spot price of WTI Crude Oil fell by 1.83% this week, closing at $45.69 per barrel. Year to date, Oil prices have fallen 14.95%. The spot price of Gold ended the week higher by 2.14%, closing at $1,254.97 per ounce. Year to date, Gold prices are up 9.37%. Initial jobless claims fell by 15,000 from last week, coming in at 233,000. The Labor Department noted that the decrease may have been a result of summer auto plant shutdowns during the July 4th holiday. The four week moving average for claims moved down to 244,000. Housing starts rose by 8.3% in June, beating expectations of a 6.2% increase. The increase was led by the volatile multifamily category (+13.3%) but single-family starts also increased (+6.3%) follow three months of declines. When you or a family member has a disability, protecting financial assets becomes a priority, especially when qualification for Medicaid and Supplemental Security Income (SSI) is involved. Fortunately, two types of special needs trusts (SNT) can help accomplish this. Both trusts offer significant financial protection and can be used to pay for quality-of-life expenses, like wages for personal attendants and travel costs as well as for home furnishings, cars and even the therapeutic treatments not covered by Medicaid. The trusts differ in the degree to which these supplemental expenses are covered. This makes it essential to choose the right one for the job. 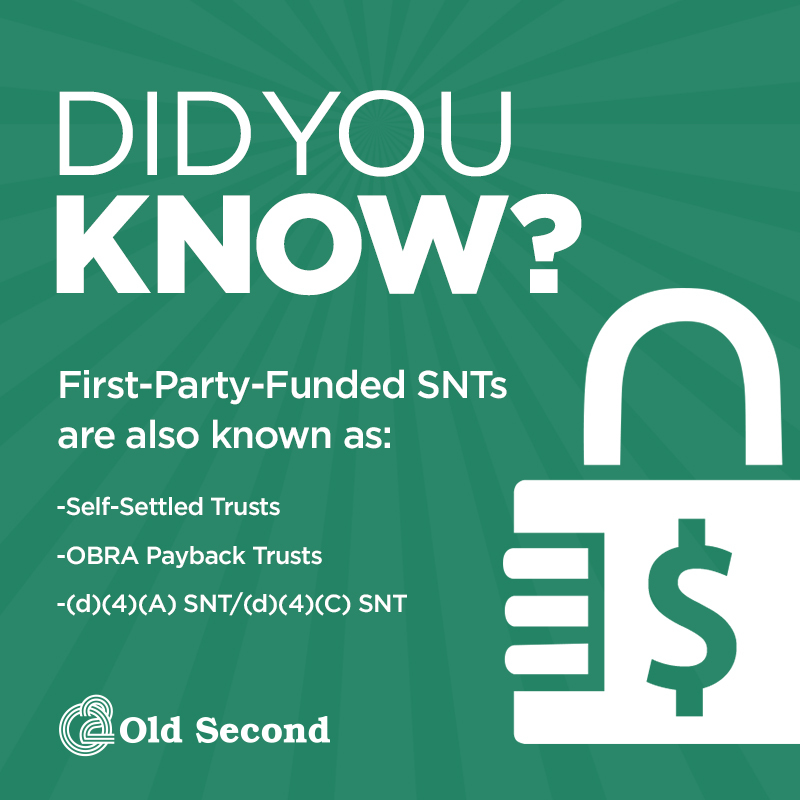 First-Party-Funded SNTs are funded using the disabled person’s own financial assets. Third-Party-Funded SNTs are created using someone else’s money, not the disabled person’s assets. While both types of trusts are exempt for Medicaid-qualification purposes, different rules apply to the way distributions can be made. This means the situations for their best use also differ. This type of trust is used when the disabled person’s own assets are sufficient to pay for the expenses Medicaid doesn’t cover. The disabled person, or someone acting on their behalf, creates the trust. That person is a parent, grandparent, legal guardian or the court. Funds typically come from a personal injury settlement, or inheritance that did not take a disability into account. These trusts are irrevocable—once established, no changes are permitted. They must also include language that declares Medicaid has a lien on the trust’s assets. Any balances due to Medicaid for services received during the disabled person’s lifetime will need to be repaid to Medicaid before any other distributions may be made per the wishes of the disabled person’s estate. Because Medicaid has this claim against the trust, all distributions during the trust owner’s lifetime are subject to review by Medicaid. The rules regarding those distributions are restrictive. For instance, a disabled person who wants to give a birthday gift to a sibling is prevented from doing so under this type of trust. The penalty for an errant disbursement can be severe. The disabled person is disqualified from Medicaid, becomes a private payer and needs to spend down the trust. Once that person’s assets reach $2,000 they may reapply for Medicaid. This SNT is also exempt for Medicaid purposes because the money is not the disabled person’s and there is not a Medicaid lien. However, with no payback provision, the allowed distributions are less restrictive and determined by the grantor of the trust. Third-party trusts are typically funded with inheritances and bequests from family members who planned ahead and created the trust. However, there are still rules. Chief among these is that the disabled person may not have any control whatsoever over the funds. Because the administration and investment of these trusts requires deep knowledge of the disbursement rules, typically either a corporate trustee or a combination of both a family member and a corporate trustee is chosen to oversee them. While naming only a family member is also possible, it puts undue pressure on that person. One false disbursement could strip a loved one of Medicaid coverage. When hiring a corporate trustee, it’s important to find one who is willing to spend the time needed to understand and accommodate not just the rules but the needs and preferences of the disabled person. If you, a friend or a family member might benefit from establishing an SNT—or from having a corporate trustee assume more responsibility for administering an existing SNT—we would be happy to talk to you about the options. Call me at 630-844-3222. I am happy to help in any way I can. Senate Majority Leader Mitch McConnell stated that the Senate will vote on the Republican health care bill to replace Obamacare next week. McConnell has agreed with Ted Cruz on a bill that would allow insurance companies to sell plans that are cheaper and simpler. The two taxes on high-income households from the Affordable Care Act would remain and billions of dollars would be spent combating opioid addiction and assisting states in lowering premiums. The bill also entails the use of health savings accounts to pay insurance premiums. Federal Reserve Chair Janet Yellen’s testimony had a more dovish tone as she indicated that balance sheet runoff would likely be pushed to September. However, Janet Yellen did provide a positive view on the economy, citing higher household spending, a pickup in business investment, and strength in the labor market. The Fed remains uncertain about inflation, but expects it to return to 2% in the next couple of years. Global equity markets reacted positively to testimony and the U.S. equity market has once again reached record highs. Markets climbed higher this week. The S&P 500 rose 1.42% and closed at 2,459. The Dow Jones rose 1.04% for the week and closed at 21,638. Year to date, the S&P is up 11% and the Dow is up 10.84%. Interest rates ended the week lower. The 5 year and 10 year U.S. Treasury Notes are now yielding 1.86% and 2.33%, respectively. The spot price of WTI Crude Oil surged 5.38% this week, closing at $46.61 per barrel. Year to date, Oil prices have fallen 13.24%. The spot price of Gold ended the week higher by 1.35%, closing at $1,228.81 per ounce. Year to date, Gold prices are up 7.09%. Initial jobless claims fell by 3,000 from last week, coming in at 247,000. The Labor Department noted no unusual factors affecting the data this week. The four week moving average for claims ticked up to 246,000. The producer price index (PPI) increased by 0.1% in June and 2% year-over-year which was slightly higher than expectations and core PPI (finished goods excluding food and energy) rose 0.2%. The consumer price index (CPI) decreased by 0.02% in June and now stands at 1.6% year-over-year. The lower CPI reflects lower energy prices. Core CPI (excluding food and energy) rose 0.12% in June and the year-over-year figure stands at 1.7%. Retail sales fell by 0.2% in June versus expectations of a 0.1% increase and retail sales (ex-autos, gasoline, and building materials) fell 0.1% versus expectations of a 0.3% gain. The University of Michigan consumer sentiment index fell 2 points to 93.1 for the preliminary July report reaching a nine-month low. In July 2009 there were 14.6 million unemployed Americans and 2.2 million job openings. In April 2017 there were 7.1 million unemployed Americans and 6.0 million job openings (Source: Department of Labor). For the first time since July of 2015, the state of Illinois has a budget after the House of Representatives overrode the governor’s vetoes. The state of Illinois’ unpaid bills reached $15 billion and the new budget is projected to bring that figure down by about $5 billion, however, according to Moody’s Investor Service this is likely not enough for Illinois to avoid being downgraded to junk status with the unpaid bill backlog and unfunded pension liability being so overwhelmingly high. The G-20 summit begins today in Hamburg, Germany where tens of thousands of protesters have already begun demonstrating a day in advance as sensitive topics such as terrorism, global trade, and climate change are on the agenda and a long awaited first meeting between President Trump and Vladimir Putin. The meeting between President Trump and Vladimir Putin is not expected to go without tension after sanctions, concerns over Ukraine and Syria, and accusations of meddling in the election have transpired in the past few months. Markets ended the week slightly higher. The S&P 500 rose 0.14% and closed at 2,425. The Dow Jones increased by 0.38% for the week and closed at 21,414. Year to date, the S&P is up 9.46% and the Dow is up 9.71%. Interest rates rose on both the short and long ends this week. The 5 year and 10 year U.S. Treasury Notes are now yielding 1.95% and 2.39%, respectively. The spot price of WTI Crude Oil fell 3.80% this week, closing at $44.29 per barrel. Year to date, Oil prices have fallen 17.55%. The spot price of Gold ended the week lower by 2.34%, closing at $1,212.60 per ounce. Year to date, Gold prices are up 5.67%. Initial jobless claims increased by 4,000 from last week, coming in at 248,000. The Labor Department noted no unusual factors affecting the data this week. The four week moving average for claims ticked up to 243,000. Nonfarm payrolls rose 222k in June which was higher than consensus expectations of 178k and prior months were revised up. The unemployment rate rose slightly to 4.4% and the labor force participation rate also increased to 62.8%. Average hourly earnings rose 0.15% and average weekly hours rose 0.1 to 34.5. The ISM non-manufacturing index rose 0.5 points to 57.4 in June against expectations of a slight decline. The ISM manufacturing index rose 2.9 points to 57.8 beating expectations with new orders, employment, and production all increasing for the month. Land trusts are a versatile legal tool for holding title to real estate. Individuals, investors, businesses and families all use land trusts to accomplish specific goals regarding the acquisition, ownership and transfer of property. Illinois is among only a handful of states that allows the creation of land trusts. Although the legal precedent originated in England, land trusts also began popping up in the United States. They first appeared in Illinois in the late 19th century and were used by real estate developers to acquire multiple parcels of land needed to build large-scale developments. Privacy is a popular reason to establish a land trust. Property can be deeded into a land trust either at the time of purchase or anytime afterwards. The trust becomes the owner of the property. The individual then becomes the beneficiary with all the rights, avails and proceeds to the property. Since the trust is the owner of the property, the beneficiary is able to keep their name off all public records. As a legal tool, therefore, a land trust can be used to accomplish very specific goals. Here are three of the most common uses. Land trusts are a great way to add a layer of protection between the beneficiary and the property that is contained in the trust. This protection ensures judgment claims against a beneficiary do not automatically become a lien on the real estate or otherwise cloud the title. If an individual or individuals are named to inherit the beneficiary’s interest after their death, the land trust is not subject to the probate process. This allows the remainder beneficiaries to manage or sell the real estate much faster. When there are multiple beneficiaries in a land trust, there may be a time when one beneficiary buys another out. Individuals may also want to gift their share to another person. Transferring interests within a land trust is accomplished easily and quickly without the need to record public documents. Since a land trust is a legal entity, you will want your attorney to prepare the Land Trust Agreement and Deed in Trust. In cases where Old Second is named as the trustee, the necessary forms are downloadable from our website. For more information on land trusts, click here or contact me directly at 630-906-5470 to discuss how this legal tool might benefit you.